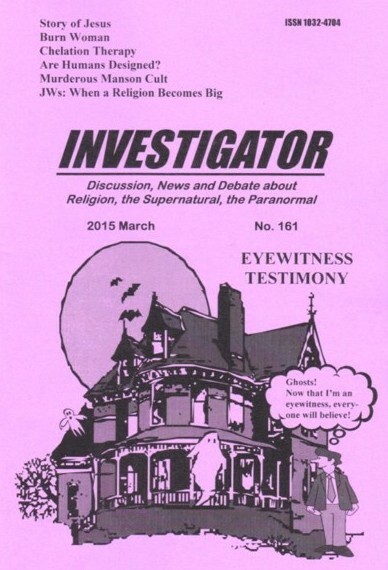 Eyewitness testimony often plays a central role as purported evidence for the supernatural and the paranormal — from sightings of anomalous animals and objects such as the Loch Ness monster, Bigfoot and flying saucers to encounters with what are perceived as apparitions and angels. Although there is no doubt that, in most cases, the observer has seen something the question is: how reliable is such evidence? Are people good observers, how good are they at recalling events and are there any factors that can interfere with these abilities? The first part examines the nature of memory and recall. The second part investigates illusions and hallucinations that can lead to erroneous conclusions about what has been perceived, and the third part enquires as to why people interpret their experience in terms of the supernatural and the paranormal. It is a feature of human memory that we do not store information exactly as it is presented to us. Rather, people extract from information the gist, or underlying meaning. When people try and make sense of events, particularly anomalous phenomena, they often attempt to obtain congruence between what they remember of an event with what they think they know and comprehend about reality. As a consequence people's memories often undergo alteration so that the event integrates with their conceptual schema of the world. Many researchers have created false memories in normal individuals; what is more, many of these subjects are certain that the memories are real. In one well-known study, Loftus and her colleague Jacqueline Pickrell gave subjects written accounts of four events, three of which they had actually experienced. The fourth story was fiction; it centered on the subject being lost in a mall or another public place when he or she was between four and six years old. "The most accurate witness statements come from people who have seen a crime and then write down what happened before they recount it or discuss it with anyone," says Farhan Sarwar. Experiments conducted by Barbara Tversky and Elizabeth Marsh corroborate the vulnerability of human memory to bias. In one group of studies, participants were given the "Roommate Story," a description of incidents involving his or her two fictitious roommates. The incidents were categorized as annoying, neutral, or socially "cool." Later, participants were asked to neutrally recount the incidents with one roommate, to write a letter of recommendation for one roommate's application to a fraternity or sorority, or to write a letter to the office of student housing requesting the removal of one of the roommates. Dr Daniel Gurney from the University of Hertfordshire interviewed 90 people about the contents of a video they had watched. During the interviews, researchers deliberately performed misleading hand gestures to suggest inaccurate information about the detail in the video. These hand gestures included chin stroking to suggest someone had a beard, although the man in the video did not have a beard. "The brain is always constructing things, which is helping you survive. Some of these constructions can be fiction," said Mark Changizi, a neurobiologist and assistant professor of cognitive science at Rensselaer Polytechnic Institute in Troy, N.Y.
Changizi came up with a theory to help explain why we see illusions. He argued that illusions are due to the brain's attempt to "see" the future. They occur during the slight time lag after light reaches the retina in your eye, but before your brain translates it into a visual perception. According to Changizi, author of "The Vision Revolution," when the brain attempts to generate a perception, it basically is taking a guess at the near future by trying to fast-forward a tenth of a second. As a result of this "neural delay," you might not be perceiving an image as it actually is, but as you expect it might soon be. "Illusions occur when the brain attempts to perceive the future, and those perceptions don't match reality," he said. Although there is no single reason illusions take place, Martinez-Conde offered another possible explanation. Ordinary social cognitions seem to play a significant role in anthropomorphic thinking. For example, by the age of five, children from every culture develop the understanding that other humans have thoughts, feelings, and beliefs that are different from their own. Humans may perceive the mental states of nonhumans using this same cognitive process. In this respect, anthropomorphism is a natural phenomenon that piggybacks on other social cognitions. People are highly social creatures, and this means they're also highly suggestible. If you see another person behaving fearfully, for example, you're more likely to feel fear, even if there's no obvious threat. The human mind is incredibly adept at building connections. This is the reason we're able to master complex math, build seemingly intelligent machines, and remember vast quantities of information. But this connection-building tendency can also cause people to believe things that aren't true. Apophenia is the tendency to see connections between unconnected events. This tendency can cause you to interpret mundane experiences as supernatural. For example, if you dream about your grandmother and then hear her favourite song on the radio, you might conclude that she's communicating with you. Although eyewitness testimony is not useless it is not completely reliable either. Many factors can contribute to the distortion of memory, from the forgetting of vital facts to the inclusion of false data. Bias, the emotional state of the witness, the number of times the event was recounted and the role the questioners played are just some of the factors that can influence recall and must be taken into account when investigating mundane events such as crimes. The need for at least equal rigor, if not more, is obvious when investigating extraordinary claims where preconceptions, the desire to believe and the tendency of humans to see things that aren't there can interfere with rational thought and dispassionate objectivity.